Tottenham have yet another opportunity to bag consecutive derby wins for the first time since a Steve Archibald brace won the day for Tottenham in January 1981. Having forged a young, yet highly skilled squad over the past three years, Mauricio Pochettino now commands the respect of the dressing room, the board and the fans – the ‘holy trinity’ of football management, some might say. The same cannot necessarily be said for Arsene Wenger, and although the latest odds on Sun Bets show that Arsenal are 7/5 favourites by virtue of home advantage, some people staunchly believe that this could be Tottenham’s weekend. Tottenham’s cause is further helped by the residual bragging rights their fanbase has, after taking four points off Arsenal in 2016/17. With no further ado, here are five wonderful derby days (from a Tottenham perspective!) to jog the memory. By lifting the First Division trophy in 1989 and 1991, Arsenal had firmly removed any doubt as to the identity of North London’s top club by the time the Premier League began in August 1992. Thirteen days before Christmas that year, Arsenal had a true conflictus horribilis with their hated neighbours, going down 1-0 in the very first derby of the new era. Faced with the wrath of Ian Wright, Tottenham goalkeeper Erik Thorstvedt marshalled his backline to perfection, and nullified anything the Gunners could conjure. The accolade of being the match winner of that watershed derby was Paul Allen, whose 20th minute strike was all that Tottenham needed to ensure a white Christmas in North London. Five months later, Tottenham completed their first league double over Arsenal since 1973/74. With Arsenal firmly mid-table, and just four days away from an F.A Cup final with Sheffield Wednesday, the more sceptical Gunner may have used those elements in mitigation. However, ‘dead rubber’ or not, local pride is priceless in a football hotbed like North London, and Tottenham seized the day in a manner truly befitting of Dead Poets Society. Teddy Sheringham had been a revelation for Tottenham, ever since joining from the eventually-relegated Nottingham Forest, and opened the scoring on 39 minutes with a point blank header. Traditionally, the favoured team would put the opposition under immense pressure straight from the restart, but John Hendry’s strike mere moments into the second half would end any such nonsense. Paul Dickov pulled one back for Arsenal on 52 minutes, before Hendry cemented the win by sliding in on a rebound from David Seaman, twelve minutes from time. After the league double of 1992/93 came a relatively bleak period. Tottenham would win several more derbies in due course, but the arrival of Arsene Wenger at Highbury in October 1996 changed everything. Suddenly, the Gunners were light years ahead of their neighbours, and Tottenham would win just one solitary derby between November 1996 and December 2007. Kind though the late 1990s and 2000s were to Arsenal, this decade has slowly seen North London undergo something of a ‘power shift’. However, many would argue that its genesis came on the evening of 22 January 2008, in the second leg of the League Cup semi finals. After a 1-1 draw at the Emirates two weeks previously, many expected a tense, low-scoring encounter. Juande Ramos is mostly remembered for pushing Tottenham to the brink of destruction, but Arsenal could do nothing about the vicious onslaught they received from his charges. Jermaine Jenas opened the scoring on three minutes, but rather than protect their lead, Tottenham sensed blood and chased a second. They got it in unusual circumstances with Nicklas Bendtner putting through his own net. After the break, an inspired Robbie Keane volleyed the third home from an overhead ball, and then laid on the fourth for Aaron Lennon. 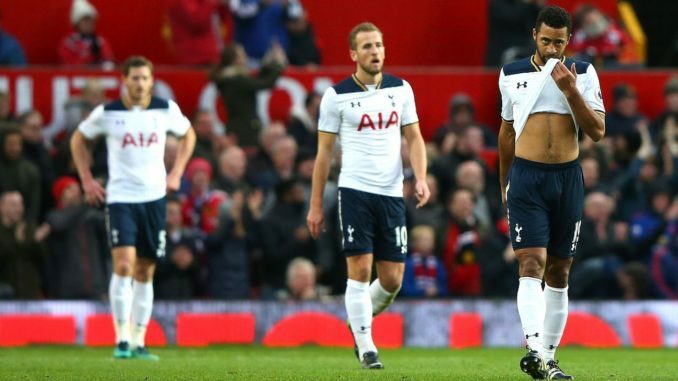 Not even a consolation from Emmanuel Adebayor could dampen Tottenham’s spirits. With the last kick of the game, Jenas found Steed Malbranque at the far post to make it an astounding 5-1, and send Tottenham through to what would be a victorious final and a first piece of silverware in nine years. A pulsating 2-1 win over Arsenal at White Hart Lane in April 2010, in which Danny Rose scored a world-class strike on his debut, is more than worthy of any list. However, away derby wins have their own unique charm, particularly when one club is clearly in the midst of a revolution, which is exactly what Tottenham Hotspur was under Harry Redknapp at the turn of the decade. Seven months after the ‘Danny Rose derby’, Tottenham travelled to the Emirates as a bonafide Champions League club full of confidence. It would be a great lie to say that the Lilywhites were still so at half time, when goals from Samir Nasri and Marouane Chamakh had put Arsenal in a commanding 2-0 lead. What exactly was said in the away dressing room is known only to Harry Redknapp, his staff and his players, but whatever is was worked better than even he himself could have possibly imagined. Five minutes after the restart, Gareth Bale halved the deficit with a great finish from an expert Rafael van der Vaart pass. The equalising goal was entirely the fault of Cesc Fabregas, with the Spaniard blocking a van der Vaart free kick on 67 minutes with his arm in the penalty box. Unquestionably a spot kick, van der Vaart himself took it and put Tottenham level. The unlikely match winner was Younes Kaboul, who found himself in the right place at the right time to head home and win it on 85 minutes. As the last derby to be played at White Hart Lane, it was meant to be. Described as a “complete performance” by Mauricio Pochettino, the 2-0 win scored by Tottenham just seven months ago was a textbook one where derbies are concerned. The first half was characterised by frenetic play, in which the game plan was to stifle Arsenal. With the Gunners effectively silenced, Tottenham went to work in the second half. Though the emphasis was clearly on preventing defeat, no Pochettino side will ever be without its chances, and Tottenham took them with aplomb in a whirlwind three-minute spell. Unsurprisingly, it was the destructive dream partnership of Dele Alli and Harry Kane which did the damage. Alli’s strike came on 55 minutes, with a close range finish under pressure from the battle-hardened Petr Cech. Then, within a mere 180 seconds, Arsenal conceded a penalty that Kane converted with his usual fearless swagger. This derby was also a primary reason that Tottenham finished three places above the Gunners, and the Lilywhites now have the chance to go five derbies unbeaten for only the second time in the Premier League era.